All the maps on the site are made with the Google maps editor. This allows them to be opened in Google Maps on your device by clicking the square in the top right corner of the map. Your GPS location will then be shown along with trail information. The Cape Cod Pathways map is a work in progress. The Barnstable section was created from existing town maps that show the C.C.P., most of the Mid-Cape was created from my wanderings through the woods and the outer cape was made from the descriptions over at the Cape Cod trails Conference website. Most of the trail sections are currently hand traced onto the map so not perfectly accurate but can give you a good idea of where you should go. 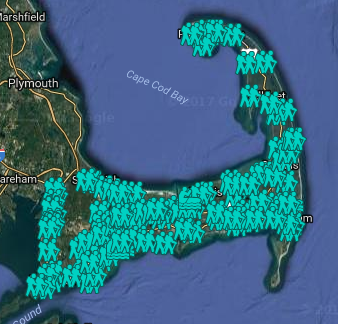 The Cape Cod Adventure Map is a collection of public property trail heads, vistas, and ways to water. I have combined many different sources to create that map and plan to update as I go along. Town maps will be more detailed than the adventure map. My hope is to include the above-listed items and trail maps. I hope you find these useful however you enjoy your time on Cape Cod. If you would like to see special items added to the maps or find anything concerning please let me know. Previous Why Secluded Cape Cod came to be.